One person has been killed in the Southwest Airlines emergency landing in Philadelphia early Tuesday, according to authorities. NTSB Chairman Robert Sumwalt speaking at a media briefing said one passenger has died in the incident involving Southwest flight 1380. 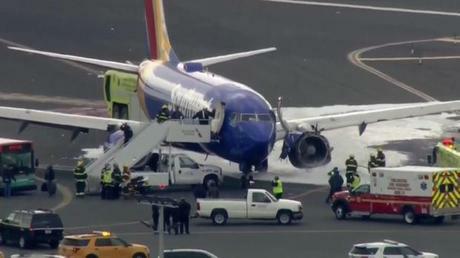 An engine failed and forced a Southwest Airlines flight to make an emergency landing at Philadelphia International Airport. Sumwalt, who confirmed one fatality, said NTSB will ship the engine offsite and deconstruct it to determine what went wrong. 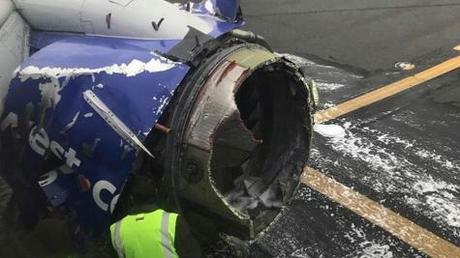 Airline officials had declined to specify the nature of the problem that forced the landing, but social media footage showed a heavily damaged engine. Passengers reported hearing an explosion and said pieces from the engine blew out a window. A woman was then partially sucked out of the plane when the window imploded, a passenger’s father-in-law said relaying information from his daughter. No word yet on if this is the passenger that died.